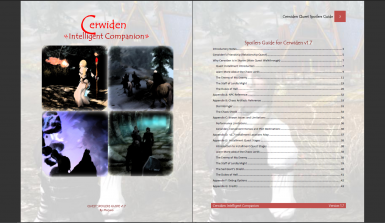 Cerwiden is an intelligent, CONFIGURABLE and CUSTOM-VOICED mage companion who can buff and heal you and your other followers. She has her own personality, installment questline, and will \"SMARTcast\" offense spells. She\'ll even engage in random, situation-aware banter, recognize your other followers, and change outfits and hairstyles. Note that some of the assets of in this mod are used by permission (please see Credits below). If you'd like to use any of those listed assets, please contact the respective others for permission. Translations to other languages to Nexus are permitted, just notify me prior. Translations to other sites are prohibited without my express written permission. Added check to ensure Ceri doesn't heal the player during "brawls"
Configuration dialogue updated with help of jburrowes to be more "lore friendly"
Want a different look for Ceri? Try the Custom Appearance Patch! Ceri voted as one of the August 2012 Mods of the Month, thank you! Cerwiden (Ceri) is a young Priestess of Donblas who hails from distant shores. She recently ventured to Skyrim, and is still new to its vast lands. Will you be her guide, friend and companion? 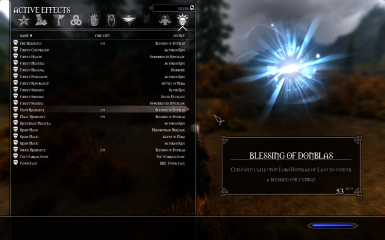 If you've played Skyrim with vanilla mage companions, you've undoubtedly recognized their limitations. Ceri is a departure from the vanilla follower mold, and is a companion who can be customized/configured to suit your playstyle and level of difficulty, extending far beyond the equipment you may give to her. 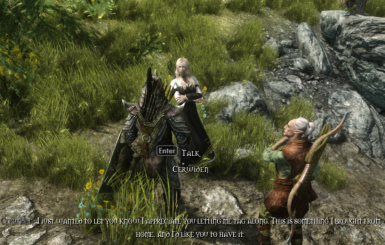 This mod comes with a fully voiced, custom dialogue-based interface, available after you first recruit Ceri, to configure how she should fight and heal, and even where to go if dismissed. The Configuration section below shows the options available, and there are many! (A copy of the configuration options map is also included in the download archive in the Data\Docs folder.) Please also take a look at the FAQ, as many questions are answered there. If you're new to using Ceri, please don't get overwhelmed at the number of configuration options. Consider leaving her at her "defaults" to start and see how it suits your style. If you find her too strong/weak for your particular game, just speak with her and give her new directions on spell/weapon use. If she's healing too frequently or not enough, just let her know. Do you want her to attack enemies when she spots them? Or try to avoid engaging enemies completely, and stick to being the party healer? Don't want her to cure you because you're using an immersion/realism mod? It's all up to you, and how you believe Ceri would be most helpful, in YOUR game. 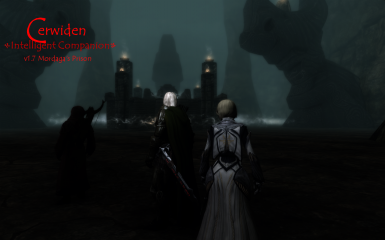 2nd Backstory Quest Installment: Help Ceri accomplish her mission in Skyrim! Includes "intelligent" enemies (e.g., mages will heal their allies, SMARTCast against you, and have a few surprises). This quest is intended for player levels between 25-45; some opponents are fixed level (between 20 and 30) and others scale with the player to level 100 but have a minimum level of 20. Full walkthrough document/spoiler guide is available for download in the Optional Files area. Initial Prototype for Better "Party" Combat: Two new quest allies to join you, one of which is a rogue archetype, the other a warrior archetype. The warrior archetype includes a defensive mode that allows for "taunting" of enemies, and the player now has the ability to call targets to these allies, Ceri's and any other followers who've been "friended" to Ceri. These allies are only available for Ceri's questline, and may be configured via dialogue or, during combat, with Ceri's Battle Command feature. They also come with a "Call Allies" spell in case you get separated. Please see the FAQ for additional information on how the new "taunt" and "call target focus" features work, and their limitations/restrictions. New Staff for Ceri: Doesn't require recharging but set at apprentice level damage, and works with Ceri's SMARTCast. Related to this, I reduced her melee and increased her staff use propensities, respectively, noting that these only come into play should you configure her to use her staff, etc. Some additional banter lines for Ceri, including some relating to vampirism. Also changed the timing of some of her existing banter. Normalized volume the voice files from v1.6.3 so volume discrepancies shouldn't be as noticeable. 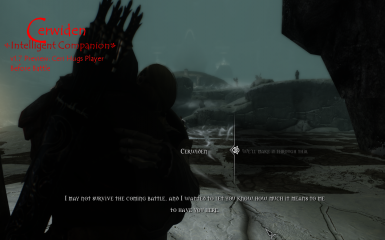 Fixed Ceri's NPC dialogue detection to work with the Companions "Take Up Arms" quest and fixed the toggle. Additional checks against brawls (I've still not been able to replicate any instance of Ceri's interference). Ceri's combat heals now also restore stamina. Fixed the broken condition in Ceri's dialogue that eliminated certain dialogue choices based on your current friend/favor progress scores. Added a debug dialogue option to "reset" Ceri's friendship quest for those who want to go back and redo it. Note that this option must be used PRIOR to starting the installment quest segments in v1.7, so if you plan on using the "reset", do it right away after you install v1.7. Fixed an empty condition that resulted in Ceri's tier 2 buff spell being unavailable. Fixed certain spell animations that weren't firing properly (e.g., Ceri's curing of the player). Fixed the "dupe exploit" relating to Ceri's remembered outfits. If you are using this exploit, re-ask Ceri to remember the outfits after you give to her. Added a check against Ceri's "don't use weapons" code to accommodate an override by Convenient Horses and mounted combat by followers. 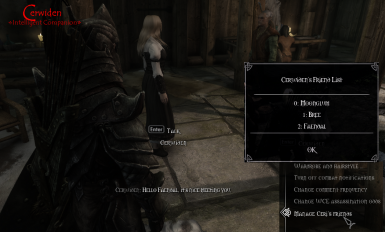 Added SEQ file to prevent the Skyrim v1.7 "dialogue bug"
Please don't forget to "Track" this mod for updates in your Tracking Center (click on the little binoculars icon above the green "Download with Manager" button). Also, your opinion matters for future development of Ceri, so please provide feedback and vote on Ceri's development polls! Poll 4: General Development Path is up! Poll 3: Interaction: This was taken between Ceri versions 1.6 and 1.7. 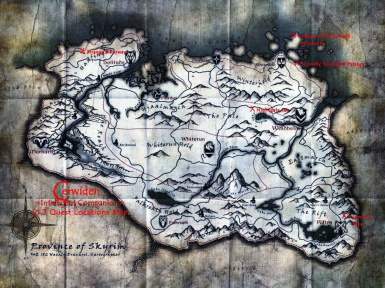 The majority of respondents picked custom followers for interaction, and for Ceri's quests to recognize the Skyrim's vanilla quests when possible. Poll 2: General Development Path: This poll was taken from the v1.5 release and closed with v1.6. The majority of respondents voted for re-voicing of vanilla dialogue (a fair bit of which is done with v1.6) and Ceri's backstory/questline (first installment included in v1.6). Mods that toss auras without requisite checks and/or use a brawl patch/plugin may cause Ceri to inferere with your brawls. Ceri is NOT the cause but is merely the symptom; see FAQ Troubleshooting section for details. 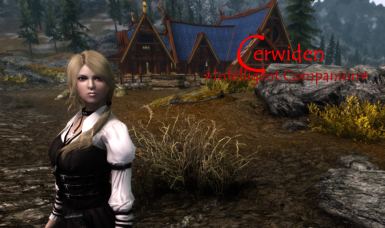 If you want to use another mod to manage Cerwiden's wardrobe or that alters your followers' outfits/gear, you'll want to toggle Cerwiden's outfit changing ability so as not to confuse the poor girl (see FAQ below on how to do so). If you want to use gear mods made for a specific body type, make sure you have it installed. Ceri isn't packaged with body meshes, so she'll INHERIT from whatever you're using. This is intentional on my part. 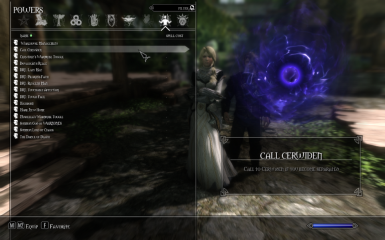 Mods that alter follower packages in combat may result in unpredictable behavior from Cerwiden (e.g., she may not heal/cure when you expect her to do so). For example, using UFO's "Stop Fighting" option in the middle of combat may result in her not healing. 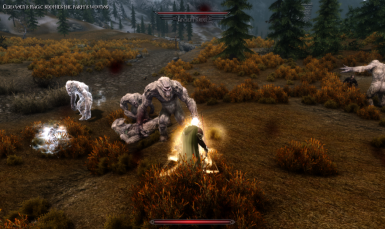 Similarly, if you use mods that allow you to add/remove perks, spells, abilities, etc., this may affect Cerwiden's AI in unexpected and unintended ways. Users report that Ceri works fine with Ultimate Follower Overhaul (UFO), Extensible Follower Framework(EFF), Amazing Follower Tweaks(AFT), Convenient Horses, Followers Can Relax, My Home Is Your Home, Spouses Can Live Everywhere. It should be noted, however, that if you use the follower mounted combat option from Convenient Horses, it WILL override any command you give to Ceri to not use weapons. This is because Convenient Horses scripts a "fake weapon" on followers to simulate combat. Mods that silence follwers will likely break Ceri's voice-based quest triggers. Mods that alter certain actor value indices, including Fame, Variable09 and WaitingForPlayer (CH and EFF accounted for already) may conflict with this mod. Please also note that Ceri's v1.7 quest installment includes some new areas, but have exterior Tamriel/Skryim entrances. Mods that alter the exterior locations may conflict, but none are known to do so at this time. NMM Install: Download via NMM or drag the archive into NMM and activate. If you use one of the options, install over the main file. Wrye Bash Install: Drag the archive into the Installers Tab. If you use one of the options, install over the main file. Manual Install: Unpack the archive and copy the contents into your Skyrim install folder, and activate in Data Files when loading Skyrim. If you use one of the options, install over the main file. IMPORTANT: When meeting Cerwiden at Riverwood's Sleeping Giant Inn, note that, if you've updated to Skyrim 1.7, Bethesda changed some parameters with custom dialogue that (sometimes) makes custom dialogue not appear when first meeting a newly installed/clean-save-updated follower. This should be resolved with the SEQ file I added in Ceri v1.7+. For earlier Ceri versions, if this happens, save; exit to the desktop; run Skyrim again and load the save. The dialogue should now appear. Optional: If you want to use the Appearance Mod Patch, see the section below the FAQ. Optional: If you use a bashed patch, rebuild it after installation. Optional: If you use ASIS (or something similar), please put CerwidenCompanion.esp in your ASIS.ini "ModExclusions" section and rebuild ASIS.esp after installation. If you don't feel like downloading the full version of v1.7.1, simply download the update version you'd like and install/activate ON TOP of your existing v1.7 install. A "clean save mod install" is REQUIRED. Follw the CLEAN SAVE MOD INSTALL instructions below. 2 Take from Ceri any equipment you don't want to lose, and say goodbye to her (dismiss her from your active followers, remove her from any follower management mod/house guest list, etc. ; if you're married to Ceri, please take note of the FAQ entry below to avoid issues). 3 If you have Ceri's summon/Battle Command spell in your Favorites menu, remove them from Favorites. From the console, type "stopquest kcfDPDialogueCerwiden" without the quotes, hit enter and exit the console. Do the same for "kcfCerwidenAddsQuest" and "kcfCerwidenModInitialize01". 5 Uninstall the old version of Ceri (if you use ASIS and/or a bashed patch, rebuild now WITHOUT Ceri to be safe). 7 Install and activate the current Cerwiden mod using the "New Installation" instructions below. 8 If you use a bashed patch or something similar, rebuild it. 9 If you use ASIS patcher or something similar, add CerwidenCompanion.esp to your ModExclusions section of ASIS.ini and rebuild your dynamic esp. 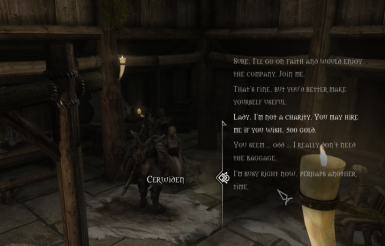 11 IMPORTANT: When meeting Cerwiden at Riverwood's Sleeping Giant Inn, note that, if you've updated to Skyrim 1.7, Bethesda changed how custom dialogue works without telling anyone and (sometimes) makes custom dialogue not appear when first meeting a newly installed/clean-save-updated follower. If this happens with Ceri v1.6.3 or earlier, save; exit to the desktop; run Skyrim again and load the save. The dialogue should now appear. This should not occur with Ceri v1.7+. 12 Reconfigure Ceri's settings to suit your playstyle and balance preferences. If you are using the Appearance Patch Mod (either with the default Alt Look or your own custom look), please see my update post because Ceri's voice type is now changed to custom. If you've modified the Appearance Patch Mod with your own look, make sure you have a copy of your modified facegen/facetints, etc., and reapply them AFTER you've installed Ceri's main mod. DO NOT REDOWNLOAD THE APPEARANCE PATCH MOD OR YOU WILL OVERWRITE ALL YOUR CUSTOMIZATIONS WITH THE ALT LOOK DEFAULT. 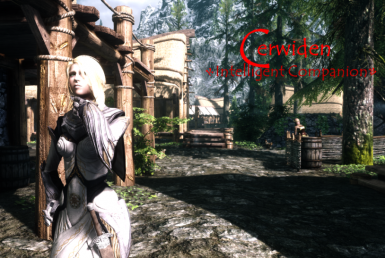 If you're using an unmodified Appearance Patch Mod, simply re-install it after installing Ceri's main mod. For Load Order, I'd recommend using BOSS, as Cerwiden is included in the master list. Many issues relating to mods "not working" can be solved through proper load order. 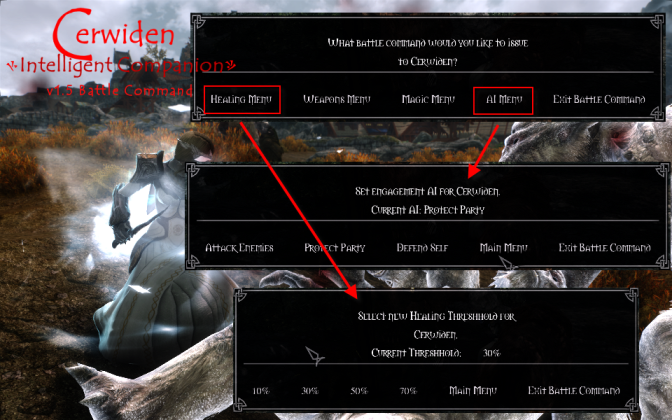 If you really, really prefer to order manually, please place this mod along with other companion/follower mods (e.g., after Ultimate Follower Overhaul/UFO if you use it) and make sure Ceri loads after ANY mod that alters DialogueFavorGeneric (how followers in the vanilla system get recruited). If you use a "bashed patch" (e.g., through Wrye Bash or SkyBash), rebuild it if your bashed dependency ordering needs updating (can't hurt to rebuild in any case). If you run ASIS, rebuild your ASIS.esp. Similar to ASIS, if you run any mod that alters NPC/followers dynamically via SkyProc or something similar (e.g., RePerkussion), re-run your configuration/patchers for those mods. 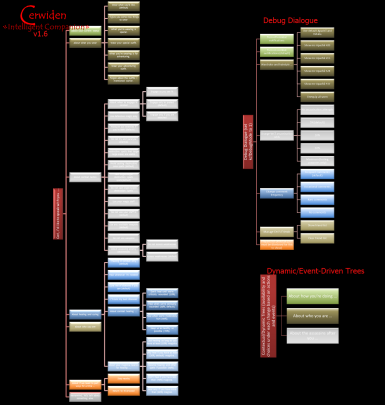 There are two ways to configure Cerwiden's behavior. 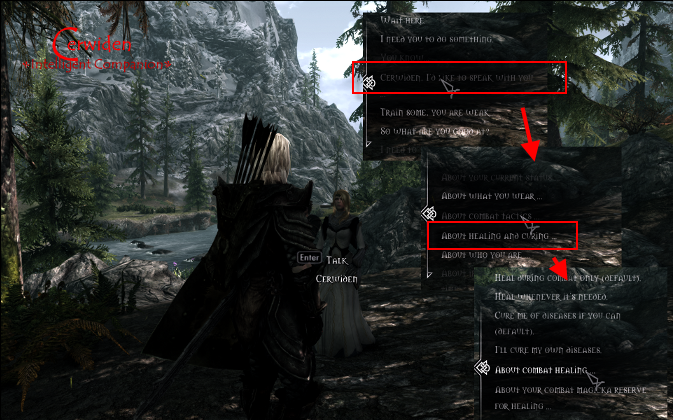 The first is through her dialogue, which is available when Cerwiden is a follower and NOT in combat. You may speak with her to access basic configuration options, as well as a summary of her current configuration. When you speak with her, you see a special dialogue branch for her configuration, as shown below. A full-size configuration chart is included in the download in the Data\Docs folder (along with the README file), and a larger version of the configuration tree is also in the Images area. Starting with Ceri v1.5, you will also be able to use "Battle Command" to have her change tactics while IN COMBAT. This is accessed through your Lesser Powers panel, and works as a "shout/voice command" so you will not need to unequip weapons/shield/spells. Battle Command works only while Ceri is a party member, and has fewer configuration options than her normal dialogue-based configuration. For example, you won't be able to set wardrobe toggles while in combat, and this is INTENTIONAL on my part. Subject to the following, Battle Command may be used to "speak" commands to Ceri, whether you're next to her or on the other side of the battle area. If you have Ceri set to "Use Weapons", you may manage her weapons (e.g., give/take away weapons) *IF* you are close to her. In other words, if you're halfway across the battlefield, you will be able to tell Ceri to "Use Weapons", but you won't be able to give her something new to use unless you are close. The reason for this is to promote a degree of "realism", and should be somewhat obvious. :P To prevent abuse of this feature, the "Inventory" option won't even display as a menu choice unless you're "close enough" AND have her set to "Use Weapons". When changing Ceri's spellcasting options, the new option(s) may not take effect until Ceri acquires her NEXT target. 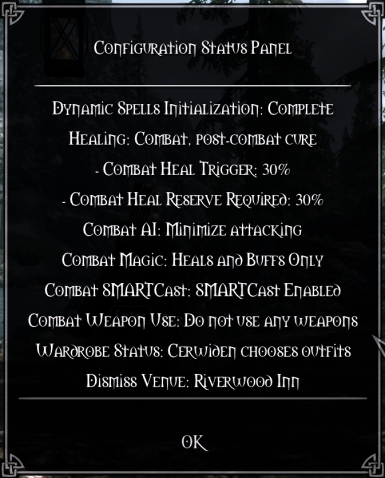 Please see the Images area for Status Panel samples of Cerwiden's "default" configuration, as well as a common "Party Healer" configuration. If you find Cerwiden commenting too frequently, not enough, etc., speak with her to configure banter probability, frequency, etc. See the FAQ for detailed instructions. 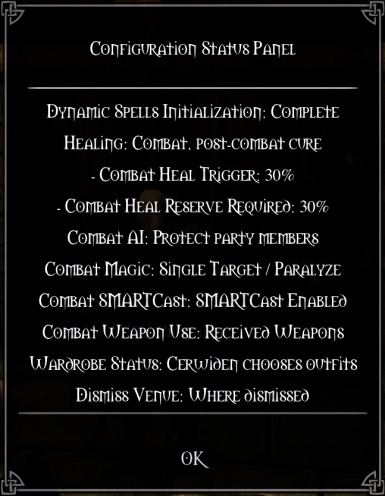 For those who find Cerwiden too strong in combat, make sure you tell her NOT to fight with her staff (apprentice damage, ironically) and/or turn off her combat spells. Both of these options are available through her dialogue configuration. Note that Ceri's staff is OFF by default. You may want to turn off SMARTCast in Ceri's configuration; with it on, Ceri will select spells that maximize damage against a given opponent's weaknesses (see SMARTCast section below for more information). For those of you who find Cerwiden healing too often during combat (she's just trying to do her job :P), set the heal threshold LOW (e.g., don't attempt heals until target is at 10%) AND the reserve requirement HIGH (e.g., if you don't have at least 90% magicka, don't cast heals). IMPORTANT: If you set Ceri to not use weapons you give her, DO NOT GIVE HER ANY. If you do, she'll junk them. This was the only way I could effectively get around Bethesda's NPC "weapon looting" combat AI with the least amount of scripting overhead. Until Bethesda releases the code for core combat to modders, I don't have many options. Please note that v1.4's SMARTCast represents what I consider to be a "proof-of-concept"/prototype of sorts and I'll be expanding on the concept in successive versions when possible. In v1.4, Ceri only considers elemental weaknesses and chooses her spells accordingly. For any given combat session, she will also only assess an opponent ONCE, and only uses available, leveled "vanilla" spells. Even with such limitations, SMARTCast makes Ceri even more dangerous and powerful than before. With v1.5, Ceri will include in her assessment whether the opponent is undead or a spellcaster. That said, and contrary to popular belief, Skyrim undead do NOT have a general weakness to fire. This includes vampires (Bethesda handles sun damage separate and apart from what is considered a "fire" weakness, at least through Skryim v1.7). For lore purposes, however, v1.5 Ceri should, as a general rule, use fire spells against undead when in SMARTCast mode. How does SMARTCast work? 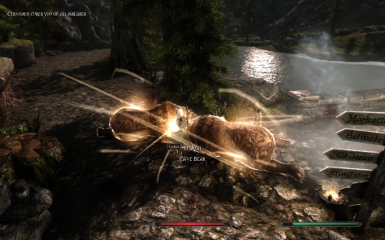 To explain SMARTCast, it's important to understand how the generic Skyrim "mage" NPC AI works (this goes for enemy NPCs as well as follower mages). The vanilla AI determines what spell an NPC caster uses based generally on (i) the NPC's available spells at a given level, (ii) the NPC's current magicka, and (iii) the spell's casting "cost", with all else equal. For the most part, NPC mages (including spellcasting followers) consider nothing else; this is why you sometimes see them cast cold/shock spells against trolls, even if they have available FIRE spells (remember trolls have a racial -50 to fire, so it'd be SMART to use fire with all else equal). This is also why you see NPC mages casting the same spell over and over until they run out of magicka for it, and then they drop to a lower spell tier, rinse and repeat. SMARTCast essentially adds another consideration factor: the spellcaster's opponent. Does the opponent have an elemental weakness? If so, Ceri will exploit that weakness if she's able. By way of example, trolls have a racial weakness to FIRE, so Ceri will choose from available, leveled fire spells. Does the opponent have one or more elemental resistances? If so, Ceri will attack the "least" of the opponent's resistances (a "relative" weakness, so to speak). If the opponent has no relative elemental strengths or weakness, Ceri will go back to the "vanilla" mage spellcasting AI. Many of you have either PM'd me or posted on the official comment thread about how to change Cerwiden's appearance without breaking the mod/losing the custom appearance when I update versions. 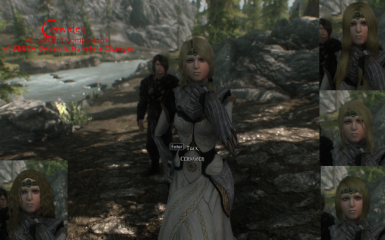 I've created a full-blown Appearance Patch Mod that uses the "ALT look" from the Images area as a reference example, including compatiblity with her hairstyle change features. Included with this mod are all the supporting files for the ALT look, as well as FULL INSTRUCTIONS ON HOW TO CREATE YOUR OWN CUSTOM APPEARANCE AND IMPORT INTO THE PATCH MOD. If you follow these directions, you will never have to worry about updates to Ceri's AI; the appearance patch mod works with all versions of Ceri from v1.0 through the current and will continue to work with future updates I may make. How to Change Cerwiden Appearance.pdf: Complete step-by-step instructions with full-color screen captures on how you can customize the included appearance patch (CerwidenAppearancePatch.esp) with your own custom look. Ceri may have some issues relating to leading the player to her questline locations. This is in significant part due to Skyrim's vanilla crap-quality navmeshes. See the FAQ for workarounds. Ceri will not use the horse given her via Convenient Horses while leading the player to a plot destination; she will instead use her "temporary" custom horse. There are some pronunciation mismatches in Ceri's quest dialogue. I'm working with the voice acting volunteers to get the lines redone. Ceri doesn't 100% stay out of combat when I ask her to. Unfortunately, this is a limitation of Bethesda's combat/follower AI. There's not much I (or anyone) can really do about this until Bethesda releases the combat code, short of what's already been done by this and various companion framework mods that essentially force followers out of combat (which, unfortunately, means Ceri won't do her combat-heals). Most users don't have issues on this after setting her "combat engagement" to be defensive (only if she's attacked). Ceri sometimes heals bandits/highwaymen/adventurers who go hostile on the player. This has a twofold cause, one of which was a judgment call by me. First, I set some of Ceri's healing to cover "non-hostiles" and, specifically, to cover 'town' NPCs in my game, which includes OCS and ASIS. Because these mods spawn critters on the outskirts of some towns, the vanilla NPCs were getting wiped out because I could not kill the spawned critters fast enough. As a result, the NPC deaths broke a number of quests, including the "Agent of Mara" quest. So what does this have to do with some bandits and whatnot? That goes to the second cause: Bethesda was rather inconsistent in how certain "world encounter (WE) quests" were coded, and these include bandits/highwaymen who ask for money, adventurers who insult you on the road, etc. In these WE quests, the NPCs start out as non-hostile; they don't go hostile on you until some dialog trigger (you don't pay your bounty, fail to intimidate the adventurer, etc.). The rub is that Bethesda coded SOME of those encounters, when the trigger occurs, to pop into a hostile faction. Others they didn't. So, as a result, Ceri reacts as she should in SOME of those instances and, in others, heals a bandit. :P If this is causing a problem in a particular instance for you, try going to the console, clicking on Ceri, and typing "resetai" without the quotes and hit enter. Because of Nexus restrictions on the amount of content included on this page, I've moved Ceri's FAQ to a forum post. Quest and Dialogue/Banter Information: Topics relating to Ceri's installment questline and dialogue, including configuration of random comment frequency. General Information: Where to find Ceri, protected vs. essential and other general information. 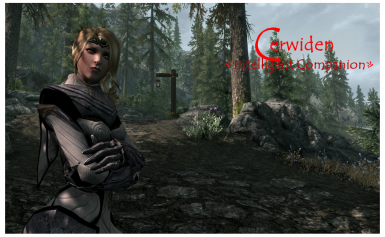 Cerwiden's Wardrobe and Hairstyles: How to manage Ceri's wardrobe functions. Use with Follower Management Mods (UFO, EFF, AFT, etc. ): Information relating to using Ceri alongside with follower framework mods. Installation and Troubleshooting: Information on error logging, load order, clean installs, and tips and instructions on what to do if Ceri isn't behaving in an expected manner. Please thank and kudo our amazing voice acting talent, without whom, we'd all be staring at subtitles! Please also extend thanks to Ceri's Beta Test Team, who did an amazing QA job!